Last Updated: September 24, 2015 | Subscribe to our weekly newsletter! If your wooden hot tub cabinet is beginning to show signs of age, it could be time to give it a fresh coat of paint or maybe even a nice stain to refresh its look. While this may sound like a job best left to the professionals, the truth is it is quite easy to paint or stain a wooden hot tub cabinet yourself. By performing this little bit of home improvement yourself, you can increase the value of your hot tub and, in turn, your home without having to invest a huge amount of money by hiring a professional. Ultimately it doesn’t matter if you paint or stain your hot tub, the important thing is that choose what works best for your hot tub and what you think looks the best. Improve the look of the wood. Alter the look of your hot tub. Better match your patio furniture. Whatever your reason may be, it is important that you do the job right the first time. If you don’t, you could actually do more harm than good forcing you to do even more work on it in order to restore it to the look that you want. Once you decide it’s time to refresh the look of your cabinet, it is time to head to the store to pick up a few supplies. Below you will find exactly what you will need in order to paint or stain your cabinet. It should be noted that if you plan on staining your cabinet, you won’t need to buy paint, although you will need the rest of the supplies on this list. You can substitute wood stain for the boiled linseed oil if you prefer. If you are painting your cabinet, you won’t need to pick up the turpentine or linseed oil, as that can be used for the staining process. Now that you know what you need, it’s time to get down the business. First, we must get the wood ready to receive either the paint or the stain. Before you can paint or stain your wooden hot tub cabinet, you need to prep the wood to receive either the paint or the stain. While it may seem like a small step, this can be the most important part of the process. Improperly prepared wood won’t accept the stain or paint as well meaning that your end result could look blotching or uneven. First, wipe away the surface of the cabinet with a damp cloth to remove any dirt or debris that has attached itself to the wood. Sand the wood carefully removing any of the old paint or sealant that is present on the wood. Once the sanding is complete, spray the wood with a hot tub cleaning spray such as CleanAll, and wipe the surface with a damp lint-free cloth. This will remove any remaining debris and dust leftover after you sand the wood. Once complete, allow the wood to dry. Now that the wood is prepared, it is time to begin staining your cabinet. Follow these steps carefully and you can easily create a naturally looking wood cabinet for your hot tub. Remove your hot tub cover and place it to the side. Carefully tape off the top of the hot tub shell and around any other hardware on your hot tub. Put on all your safety gear and get ready to mix the stain. Using a large measuring cup, mix 2/3 boiled linseed oil and 1/3 turpentine. Mix them well. Using a lint-free cloth, apply the mixture to the wood by dipping the cloth into the solution and rubbing it into the wood in the direction of the grain. Add multiple coats to reach the color of your choice. Depending on the fade of the wood and the darkness you are trying to reach, you may have to apply as many as four coats to your cabinet. All the cabinet to dry then remove the tape and replace your cover. There are alternatives to using boiled linseed oil. Instead, you can purchase many different types of wood stain of a color that you desire. The process, however, remains the same. Just replace the linseed oil steps with the wood stain of your choice. If you have decided to paint your cabinet instead of staining it, all you have to do is follow these easy steps carefully. Using your painters tape, carefully cover the edges of your hot tub’s shell and any hardware attached to it that you don’t want to accidentally paint. Follow all the steps above to prepare the wood. Once the wood is dry, begin applying the paint to your hot tub using up and down strokes that follow the grain of the wood. Apply additional coats as necessary. In most cases, you will probably need 2 coats of paint for it to properly cover the wood evenly. In more extreme cases, you may need to add one extra coat to give it the proper look. If you happen to be unsure of the color you should use, you could always paint just one small corner with different colors to see which one you like the best. These areas should easily be covered with the multiple coats of the color that you choose. Remember, just because your hot tub has begun to show its age doesn’t necessarily mean that is has come to the end of its life. As long as the internal components and the shell of your hot tub are in good working order, your hot tub should last you for quite some time, no matter how bad the wooden cabinet is beginning to look. With just a little bit of work on your part, you can easily refresh the look of your wooden hot tub cabinet and make it look like it is brand new again. Whether you choose to stain the wood on your cabinet or paint, remember to take the proper precautions to protect both yourself and your hot tub during the process. 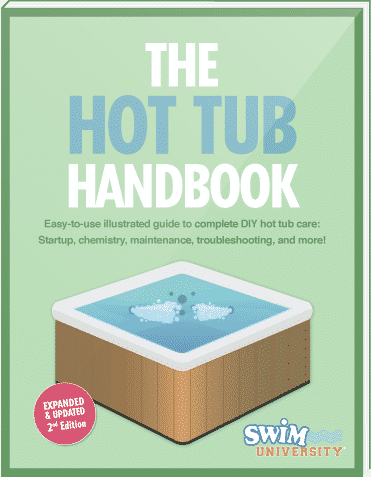 Find out how to quickly fix cracks and scratches in a hot tub so you can return your spa back to the way it looked the day you had it installed.